Late this week, Disney Cruise Line quietly added a new 3-Night Bahamian Cruise aboard the Disney Fantasy departing May 17, 2017. This new sailing represents the first every guest Bahamian cruise on the Fantasy and the itinerary features two days at Castaway Cay. For those wondering how and why this sailing was added considering the sail dates for the Disney Fantasy currently extend into 2018. Well, back during the Winter 2017 itinerary release DCL left a 3 week gap in the Disney Fantasy’s sailing schedule beginning in late April. Based on the age of the ship we penciled this in as her first dry dock as the gap was the same as the Disney Dream’s first dry dock last fall. 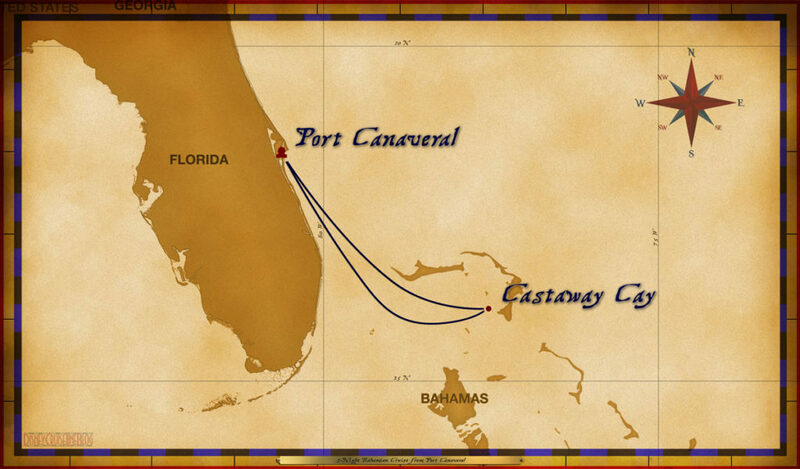 This new sailing, leaves Port Canaveral on a Wednesday May 17th and returns on Saturday, her normal turnaround day. This leaves me to speculate that DCL finalized the dry dock schedule and found just enough time to squeeze in a short cruise which should make it easier for people to preview the changes before the Disney Fantasy resumes her full 7-night Eastern and Western Caribbean cruises. Again, please note: DCL has NOT confirmed or announced any dry dock dates or plans for the Disney Fantasy. This last paragraph the dry dock is purely speculation. This entry was posted in Itineraries and tagged Bahamian, Castaway Cay, Disney Fantasy, Dry Dock by Scott Sanders. Bookmark the permalink. Wow. Love this. First sailing after a potential rehab AND 2 days at Castaway Cay! Does anyone have Navigators from Trans-Atlantic cruises (Magic)? Dennis, You can find links to the navigators from the Disney Magic’s 2016 transatlantic cruises on this page. Nice! Just booked this cruise! Thrilled! We just got off fantasy this morning and our head server mentioned her going into dry dock on the spring. And specified she’d be going to Freeport. This is a great cruise! You get to experience the usual 7 night Fantasy and get 2 days at Castaway Cay, I like both these things. I already have 2 cruises booked for 2017, 3 would be too much right? Maybe I could get a second job to pay for my cruising addiction. Does anyone have a guess of how long and what will be done during the dry dock ? If the itinerary gap is the dry dock, then it will be 18-days. I may have to book this….it’s my birthday on May 17th!! What better birthday present than another Disney cruise!! I actually think that is a sign. The Disney cruise I have booked is on my birthday in September. Birthday cruises are a lot of fun! How does the double back to back castaway cay work? Does the ship stay parked over night? Or does it pull away and come back? Do you get a longer day at castaway cay? They would leave and sail around then return in the morning. Thanks. I know Disney has not released any drydock information, but just wondering if you have any opinion on how extensive it might be (assuming there is one). Is a first drydock usually just cosmetic and fixing any mechanical issues, or would they possibly do reimagineering, like change out a restaurant or redesign the kid’s club?